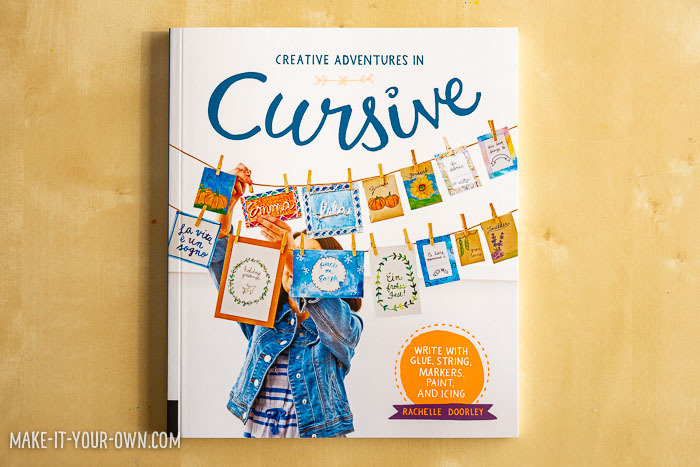 We recently received a copy of Creative Adventures in Cursive by Rachelle Doorley of Tinkerlab (https://tinkerlab.com/). We have been long time followers of her ideas and her creative challenges and were excited to see what this book had in store for the art of cursive writing! 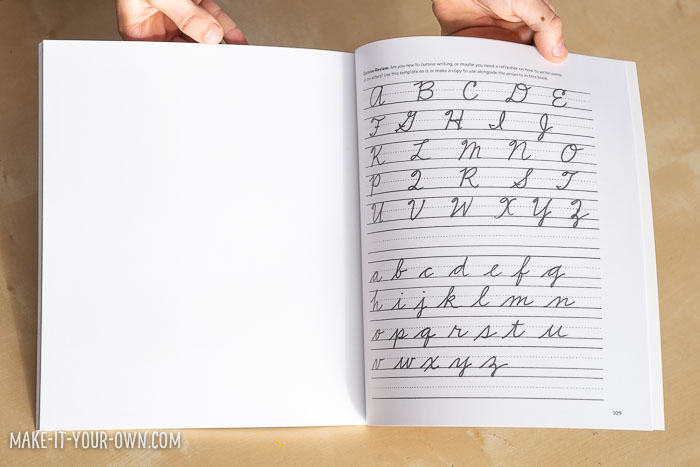 The educator in me is always looking for exciting, engaging and hands-on ways to teach different topics or processes and the book got us excited about developing and applying our cursive writing skills. 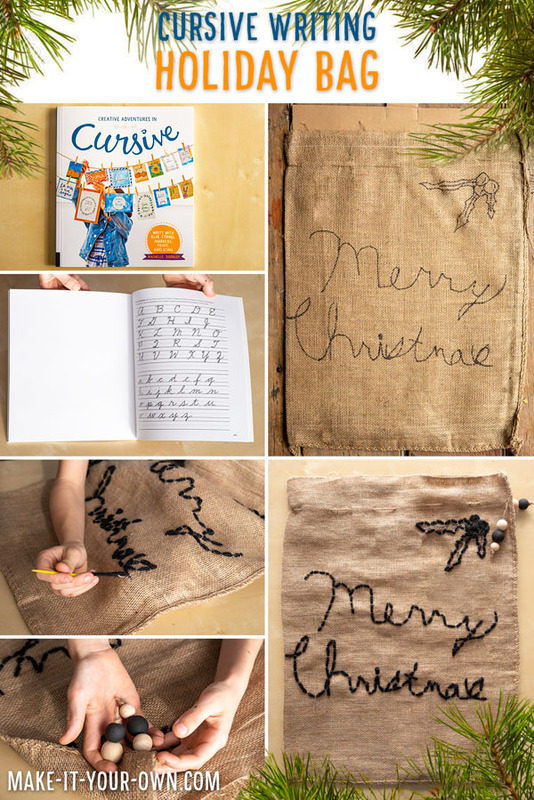 Inspired by the projects in the book, we decided to make a personalized Christmas sack that my son’s teacher can use from year to year with his writing on it! 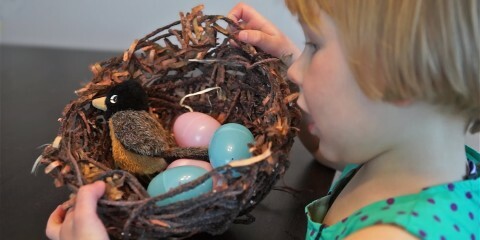 She taught him how to embroider, so we are sure she will be excited to see this variation! Using the handy letter chart in Creative Adventures in Cursive, we practised writing out the message we wanted for our holiday sack on paper with a pencil. 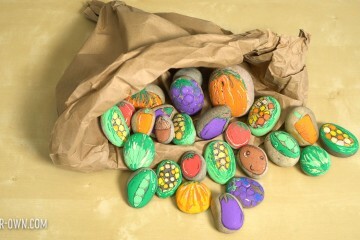 We wrote, “Merry Christmas”, but you could do this for any theme- Hanukkah, birthday parties, Mother’s/Father’s Day etc. 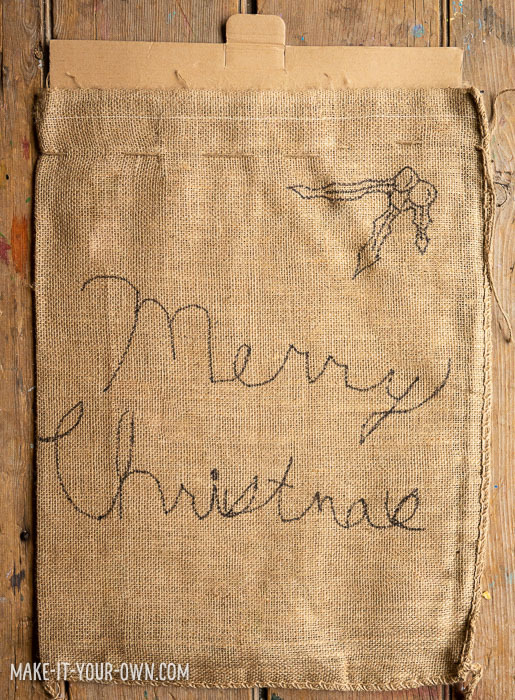 Once you are ready, place a piece of cardboard inside of your sack, so that the marker doesn’t bleed through and write your message on the front using your cursive writing. 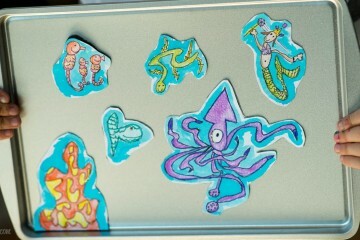 Write your message with marker so you can clearly see the lines for you to sew over. Thick yarn/wool will cover these lines. Cut a length of yarn (we go between the length of your hand to your elbow or from your hand to your shoulder depending on one’s age and ability- too long of a length is hard for anyone to work with!) 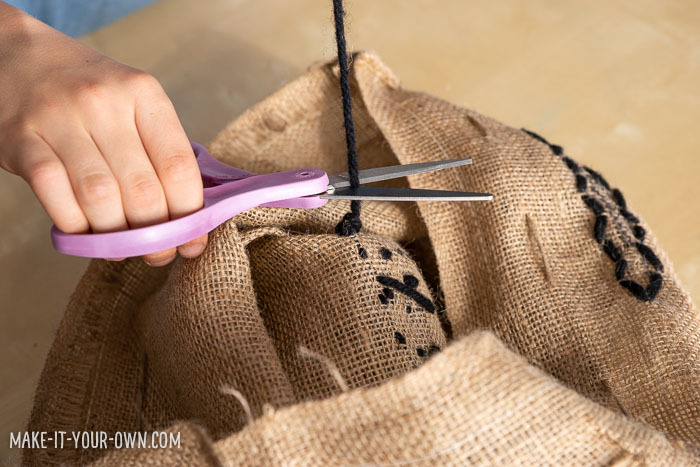 Knot your one end (you might have to do it a few times, so it won’t slip through your burlap holes) and then thread your yarn through the other end. 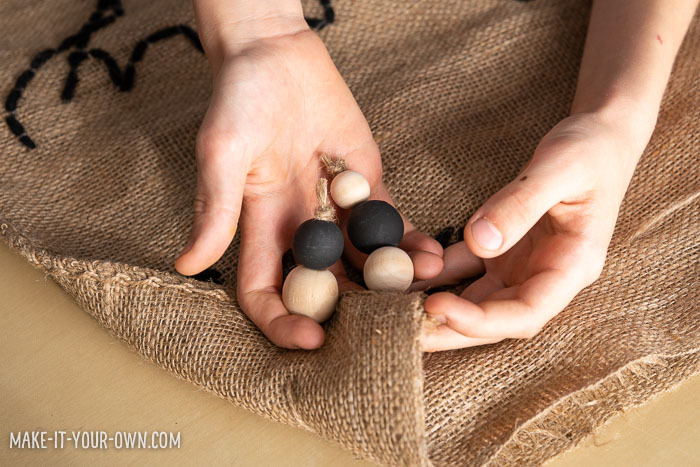 You will have to use a sturdy needle with a large hole for this project- either plastic or metal. 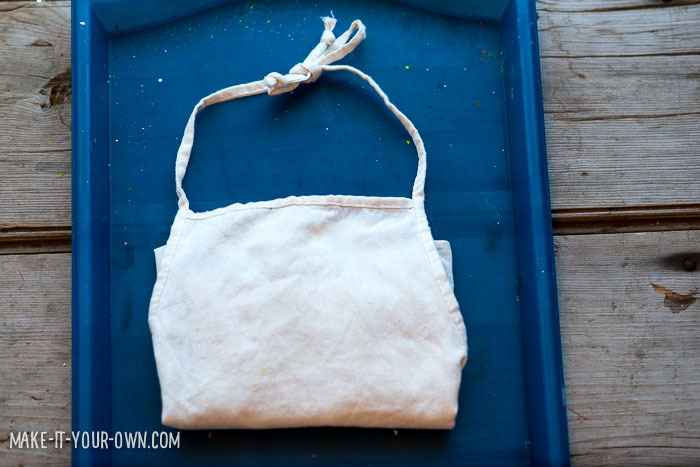 Start in the inside of the bag at where you started your message and sew. 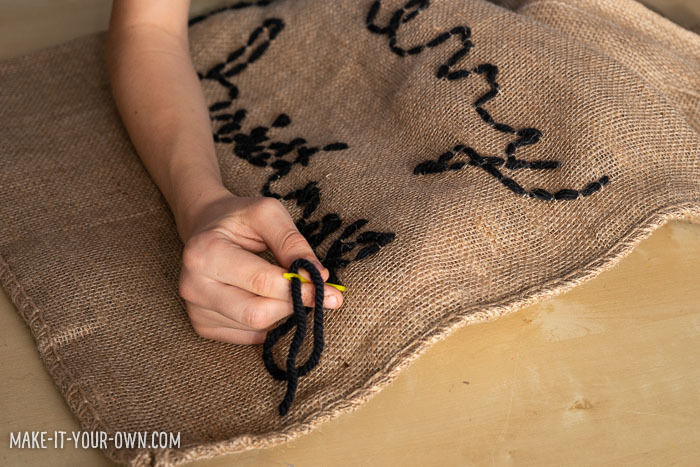 We used a basic stitch, going up and down (as we are just learning), but you could be elaborate as you like! We kept our non-dominant hand in the bag and fed the needle back and forth so as to not accidentally sew the two layers of the bag together. You can add some details (such as the holly) if you like. We also added a few beads to the drawstring to jazz it up a bit! 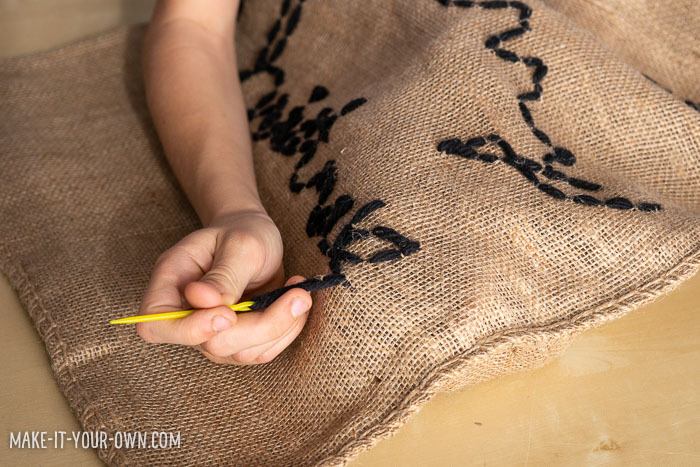 Once your bag is done, pop in something special and give your personalized bag to a friend! Developing one’s fine motor skills through cursive writing and sewing. We suggest that you use a tray or table cloth and a smock to protect your clothing and surfaces.